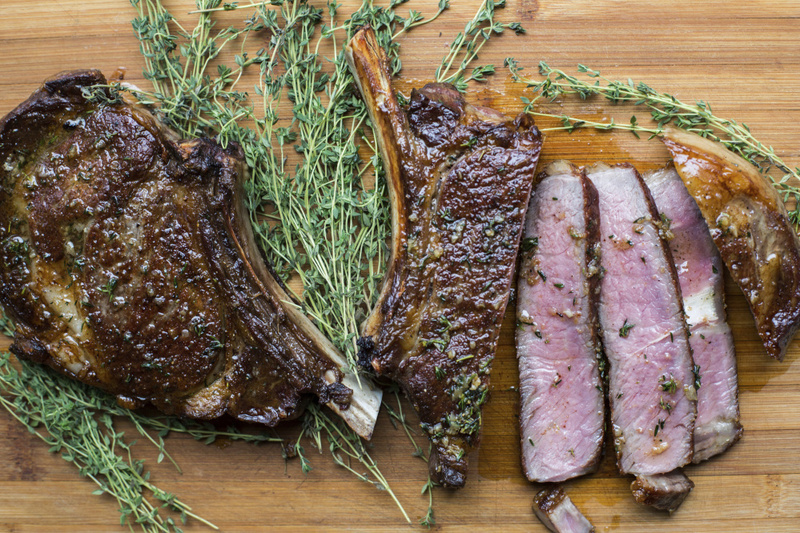 Five tips for making a great steak dinner. A perfectly cooked steak is what many people – with good reason – think of as a perfect meal. This is a classy take on a restaurant-quality steak dinner, and other than remembering to salt the steak ahead of time (not a deal breaker, but recommended), it’s only 30 minutes from start to finish. Note these instructions are for a thick steak, at least 11/2 inches thick. 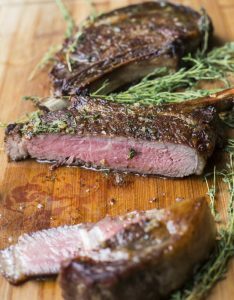 Thinner steaks don’t need the additional oven-roasting time, and will likely be overdone if they go into the oven after they are seared on both sides. 1) Salting the meat a day before cooking it draws out excess liquid, concentrating and developing the flavor, and allows the meat to form a nice caramelized exterior. You can salt it an hour ahead too, but the longer time allows the seasoning to get past the surface into the middle of the meat. 2) Let the meat come to room temperature before cooking, or the inside will take significantly longer to warm up and cook, and by that time the outside of the steak will be overcooked. 3) Pat the meat dry before putting it in the pan. If the meat is wet, it won’t sear well. 4) Use an oil with a high smoking point, like canola or vegetable, to cook steaks on the stove. Butter or oil with a lower smoking point will burn, and cause the steak to have a burnt taste, even if it is not overcooked itself. Butter is a lovely thought, but add it at the end and just allow it to melt in the hot pan. 5) This doesn’t affect the quality of the steak, but turn on the exhaust fan! Odds are there will be a lot of smoke, so prepare by turning on the fan, opening windows and doors as you can, and thinking of this as a test to see if your smoke alarm batteries are still working. And there you have it. Roast some potatoes once the oven is preheated, add a little sautéed spinach (cooked up while the steak is in the oven) or a green salad, and you’ve got that perfect steak dinner in your own home. The night before cooking the steaks, salt and pepper them liberally, and put them on a plate (if you have a wire rack, place them on the rack over a plate). Refrigerate uncovered overnight. One hour before cooking the steaks, take them out of the fridge and allow them to come to room temperature. Preheat the oven to 400 degrees F. Heat the oil in a large skillet (big enough to hold both steaks) over high heat. Pat the meat dry and add the steaks to the pan. Sear for 4 to 5 minutes, until the bottom is nicely browned, and then flip the steaks and brown for another 3 minutes. Transfer the pan to the oven and roast for another 5 to 10 minutes until the internal temperature reaches 120 to 125 degrees F for rare, 125 to 130 degrees F for medium rare. Remove the steak from the pan to a cutting board, pour off any fat that has accumulated in the pan, and place the pan over medium low heat. Add the butter, garlic and thyme, and stir just until the butter has melted and you can smell the garlic (this will be quick, about 30 seconds, as the pan will be hot). Brush half of the seasoned butter over the resting steak and pour the rest of the butter into a small bowl. Let the steak sit for 10 minutes. Slice the steak with a large, sharp knife, and fan out the slices on a serving platter. Brush the slices of meat with the remaining melted butter.